Saffron Spice Kitchen has found a choice but super competitive lunch spot near the corner of Queen and Spadina so it's a good thing that the restaurant's owner, Chef Johnny, has a secret weapon to fall back on. Many may be familiar with the midtown spot Esther's Soup Kitchen . During the lunch rush this place sports a massive line as hungry patrons wait to hug a bowl of the highly coveted mulligatawny. It just so happens that this "Esther" is Chef Johnny's aunt and she's been mentoring him behind the scenes about the finer aspects of the Sri Lankan and Indian cuisine that he dishes up each day. On the menu at Saffron Spice Kitchen are crowd pleasers like butter chicken and tandoori wraps, all expertly spiced and made to order. There are also salads and other lighter fare for those looking to avoid that mid afternoon Indian induced coma at their desk. 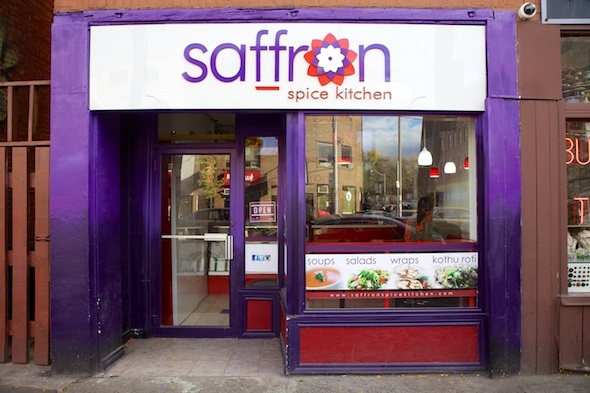 Unlike many of the other Indian restaurants that line Queen, Saffron Spice Kitchen doesn't use ghee, cream or butter in its dishes. 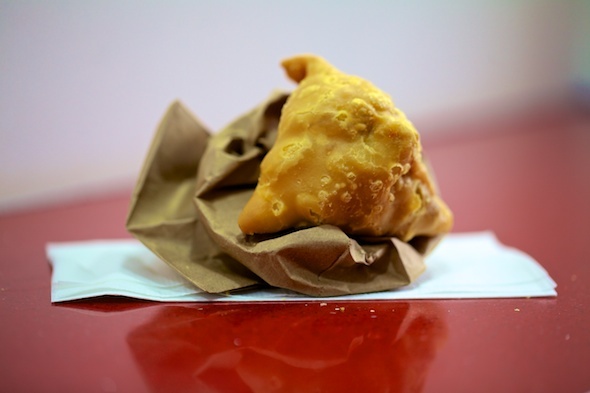 We decide to start with the samosa ($1.50). The crust is sweet and crispy, the filling soft and loaded with a tango of sweet and savory spiced potatoes. Sadly, a lonely single pea seemed lost without a few of its other friends. 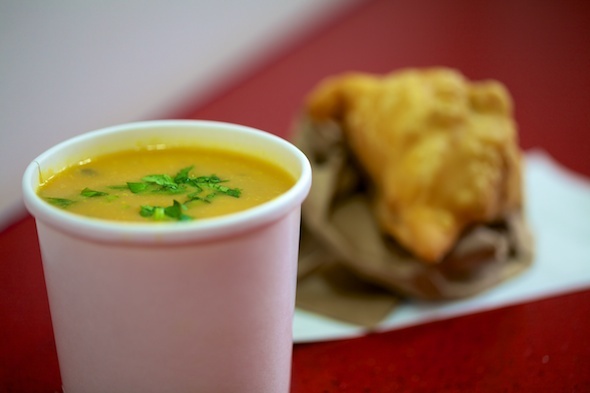 The Thai Pumpkin soup ($4) is the special of the day, decorated with fresh bright green cilantro. The consistency is not too thick and the flavour, balanced, allowing the true taste of pumpkin to shine through. We couldn't pass up the Kothu Roti ($7.50) which we're told is the most popular item on the menu. 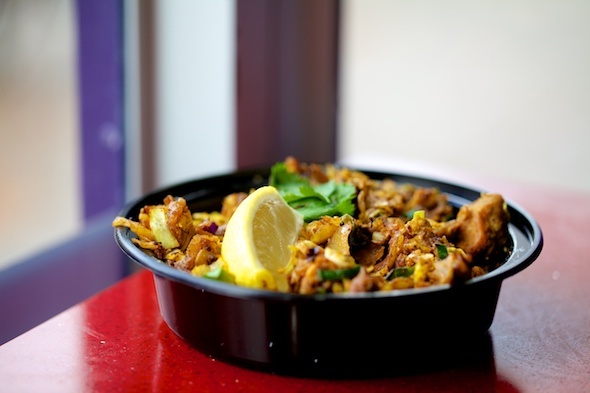 The roti is made fresh daily, chopped into tiny pieces and then mixed into a teppanyaki style stir fry with heavily spiced vegetables and a choice of curried chicken, lamb, seafood or egg. It's packed with flavour and texture, but leaves us panting and seeking refreshment. 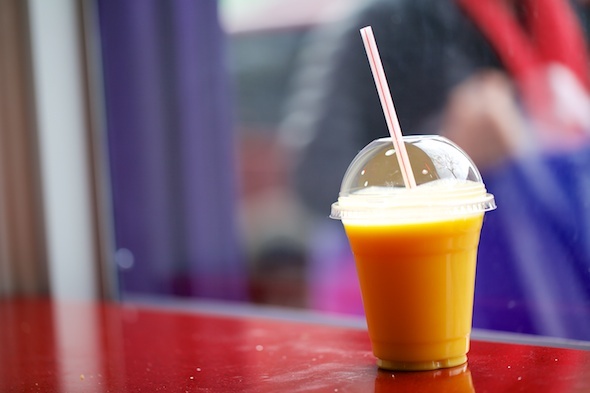 Thankfully, we were smart to order a mango lassi ($2.50) which is not too thick and naturally sweetened. Thirst quenched, we decide to close the meal with a side salad ($4.50) of spinach, purple cabbage, baby tomatoes, cucumbers and lentils. 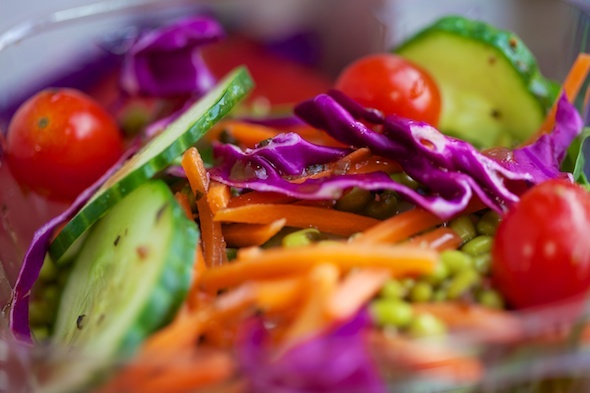 The salad dressing is a bit flat and could benefit some of the creative spicing given to the other dishes. Saffron Spice Kitchen offers their affordable lunch menu daily from 11:00am-10:00pm.